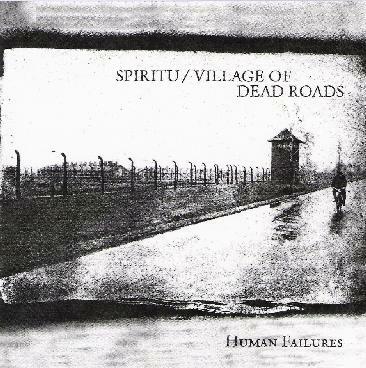 Spiritu / Village of Dead Roads - "Human Failures"
Wow... Meteorcity is back with a split CD. The label who dominated the Stoner rock scene for many years has released very few things in 2005 and it seemed it might disappear. Looks like it ain't dead yet... good thing. Spiritu starts the CD off with "The Ten of Seven Bell". The production sound is much more raw and not as full as their debut CD and some of the drum sound is just awful sometimes, but they have a lot of raw energy and rock, though the first two tracks are not very memorable songs. It is a bit more doomy than their debut. They start getting interesting when they freak out during "Lattitude", their 8½ minute track, but then the last 3 minutes just disappear instead of coming back with the original riff again. "Throwback" is by far the best track by Spiritu with a great riff and groove. Village of Dead Roads, gives us 4 tracks in 32 minutes (with each track getting longer and longer) and some much heavier and more interesting than Spiritu. This is some heavy stuff like the good old Melvins early music. The vocals reminds me of the first Carnivore record a bit. "Skin Prison" is a very cool track with some multi-layered guitars in the quiet mid section that are quite cool and psychedelic before the track builds up again. "Woman of Ill Repute" beings with a sample from some horror movie or something with some very doomy riffs before the pace picks up and the band really grooves. The CD closes with the 11 minute "Divine Mistake", which features many moods. Amazing stuff from Village of Dead Roads (5 out of 5) and not so amazing stuff by Spiritu (2 out of 5).